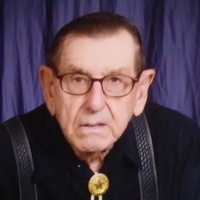 Harold Charles Franke, 85, of Rowena, TX passed away Saturday, April 13, 2019 at Ballinger Healthcare and Rehabilitation Center. Harold was born July 26, 1933 to Anton and Leona (Niehues) Franke in Rowena. He served his country honorably as a member of the United States Army. He married Dolores Lucy Jost on September 27, 1961 in Olfen, Texas and recently celebrated their 57th wedding anniversary. Harold worked as a telecommunications technician for GTE for 30 years. After retirement from GTE, he worked for Walmart as the handyman “Carl” for 12 years. Harold was an active member of the Rowena Volunteer Fire Department, St. Joseph’s Catholic School Board, American Legion, and Veterans of Foreign Wars. He also was in the Knights of Columbus where he was a Fourth Degree Knight. He was a loving father, grandfather and great-grandfather, known as Papaw, who cherished spending time with his family. Harold enjoyed country/western and polka dancing with Dolores. He enjoyed vegetable gardening, tinkering around his workshop and doing word find puzzles. Harold is preceded in death by his wife, Dolores; his parents, Anton and Leona; and his sister Rose and brother Leon. He is survived by his children, Kevin Franke and wife, Wanda of San Angelo, TX, Craig Franke and wife, Kelli of Crestview, FL., Terry Franke and wife, Michele of Concord, NC, and Debbie Hurt and husband, Aron of Rowena, TX. He is also survived by brother Wilfred Franke of Ballinger, TX, sister Sylvia Rollwitz of Rowena, TX, sister Eileen Weller of Merced, CA. He is also survived by grandchildren Ashley Kimbriel, Courtney Tant, Tyler Franke, Bryce Franke, Chase Franke, Kamryn Kennedy, Kayla Kennedy, Erica Franke, Erin Franke, Brittany Hurt, Colton Hurt and Derek Hurt. He is also survived by great-grandchildren Parker Kimbriel, Mason Tant, Phoenix Tant, Jules Kimbriel and Silas Jarvis. Rosary Service will be held at 7:30 pm on Tuesday, April 16th at St. Joseph Catholic Church in Rowena, TX. Mass of Christian Burial will be celebrated on Wednesday, April 17th at 10:00 am at St. Joseph with Father Arial Lagunilla and Deacon Alan Pelzel officiating. Burial will follow at St. Joseph Catholic Cemetery in Rowena, TX. The family would like to express a special thank you to all the staff at Ballinger Healthcare and Rehabilitation Center and Ballinger Home Health and Hospice. Guests may register on-line at ballingerfuneralhome.com. You will be missed you old sauerkraut!